Christine Benz: Hi, I'm Christine Benz for Morningstar.com. Because of the annual investment minimum, it can be difficult to build a well-diversified portfolio within the context of an IRA. Joining me to share some mutual fund pairs that could help diversify an IRA is Russ Kinnel. He is director of manager research for Morningstar. Benz: Russ, this was the focus of the latest issue of Morningstar FundInvestor. You looked at two funds that could help investors build a well-diversified IRA. Before we get into those, let's just talk about how investors should think about their IRAs. Because I think some investors do think, OK, I'm setting up this IRA, it should be internally well-diversified. I should have every asset class that I want. Is that necessarily the case? Kinnel: I think it should be balanced. I don't think it has to be a complete portfolio. I don't think you need to have everything covered there, because really it is a complement to the rest of your portfolio. And as you mentioned at the top, the fact that you've got these limits on contributions makes it tough to really cover everything. So, I think you can really just go for core holdings. Benz: But you did look at this concept of putting together two funds, how actually you can get yourself quite far in terms of diversification by pairing the right complementary funds. So, let's start with a pair of funds that would really work best for investors with very long time horizons. So, this is someone who has a lot of appetite for equity risk and the volatility that comes along with it. This would be T. Rowe Price Blue Chip Growth and Artisan Global Value. Let's talk about why those two funds would be so complementary. Kinnel: We are really covering a lot of bases here. Again, not everything, but you have a nice dedicated growth fund in T. Rowe Blue Chip Growth; good growth manager; and T. Rowe, obviously, is a great steward that you really can have faith into the long haul. And then, Artisan Global Value run by Dan O'Keefe is going to cover the value side of the style box. But because it's global and has about a 50-50 U.S. to foreign mix, you've got foreign equity covered, too. So, again, you are not covering everything, but you've got a lot covered there. And two nice complementary funds that really are not going to have much overlap at all. Benz: One question on T. Rowe Price Blue Chip Growth. I used to cover the fund as an analyst. Larry Puglia, he has been there a long time, fantastic manager. We've seen some retirements at T. Rowe Price over the past few years. Is he potentially getting close to retirement or has T. Rowe Price given any indication on that front? Kinnel: They haven't really given an indication. But yeah, I think you are right on the money that he is closer to retirement. T. Rowe managers rarely go past 65. And so, you can kind of set your watch to somewhere between 57 and 65 they are going to retire. So, yeah, I do think that's a probability, say, within the next five years or so that he probably will either retire or announce retirement. So, yes, you are, kind of, taking faith in the next person, but T. Rowe has handled these transitions really well. So, you've got some time with Puglia and probably another good manager after that. Benz: Let's talk about another pair. This one too strikes me as pretty aggressive. This is Vanguard Total Stock Market Index and Loomis Sayles Bond. People might think, bond, OK, that's more conservative. Well, Loomis Sayles Bond is not a conservative bond fund. Let's talk about how those two might work together. Kinnel: That's right. So, we've got a 50-50 mix. And because I think you've got Total Stock Market, in some ways, it's conservative. Obviously, it's going to do exactly what the market does. So, if the market goes down 30%, it's down 30%. But it's a very diversified dependable investment. So, I thought given that a fund like Loomis Sayles, it's a multisector bond fund with a lot--it's got credit risk, it's got foreign-currency risk. It's actually, kind of, a nice complement. It gives you some foreign-currency exposure as well as foreign-market exposure. Obviously, not foreign equities, but foreign bonds in this case. So, yeah, Loomis Sayles is an aggressive fund. And that's why I kind of like pairing it with this more sedate dependable low-cost fund. So, it's kind of an interesting mix when you put the two together. Benz: Loomis Sayles Bond, I know it's a fund that we as a firm have long liked. It was recently downgraded. It's still at Silver, but it came down from Gold. What was the thinking there and it's obviously a fund that you and the team still like quite a bit? Kinnel: That's right. They've ramped up their equity exposure a little more. So, it's about 8% today. And so, obviously, we really want the fixed-income exposure from this fund. So, that led us to take it down a notch to Silver. But Silver still means we have tremendous confidence in the firm. And of course, Dan Fuss, we know he is getting closer to retirement. So, that's really based on the team around Fuss, more than Fuss himself now. Benz: A somewhat more-conservative pairing would be Dodge & Cox Balanced and PIMCO Income. Let's talk about that, why you think that those two funds could potentially work well together in an IRA. Kinnel: An even mix of these funds gives you about 30% equity. So, yeah, now we've dialed it down somewhat. And again, I've kind of got a conservative and a more aggressive fund here. Dodge & Cox Balanced, relatively conservative, value equity plus corporate bonds. And then PIMCO Income is a more-aggressive bond fund, but it doesn't do a lot with corporates. It's much more mortgages, including nonagency mortgages, which is a riskier part of mortgages, and other asset-backed securities. So, it's a relatively aggressive fund. But I think again, you kind of have best-in-class. Dodge & Cox is excellent at picking equities and corporate bonds. Dan Ivascyn of PIMCO Income is great at mortgage and other asset-backed selections. 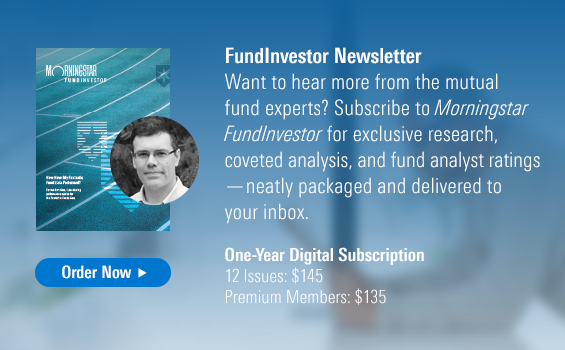 So, you have two great funds. And again, now, you're down to about 30% equity, you wouldn't exactly call this a low-risk portfolio, but it's lower risk. Benz: Dodge & Cox Balanced, Russ, you mentioned it is the more conservative of these two. But one thing we did see was during the financial crisis I think it disappointed some investors. It didn't have the best performance during that down market. Kinnel: That's right. They are very much a dedicated value shop. And so, in '08, '09, it was financials that got hit. And so, Dodge & Cox and pretty much everyone who does value got hit pretty hard. But if you look at the long-term record, Dodge has just done an outstanding job. The next bear market probably won't hit financials, probably hit another sector. So, therefore, they probably won't be as disappointing. But I think the long-term record really speaks for itself. Dodge & Cox has low costs, tremendous stability of management and analysts. So, I really think there's a lot to like there. I think it's a good firm. If you are picking an IRA where maybe you want to hold it for ideally 20 or 30 years, they are a great firm to bet on. Obviously, at some point, you could change it if you needed to, but still, I think they are a really dependable firm. Benz: The IRA contribution deadline is coming right up if you want to make a contribution and have it count for the 2018 tax year, so that's your tax-filing deadline. Russ, thank you so much for being here to share these interesting IRA ideas.